Where care and compassion comes first. Going away? Have your fur-baby stay with us. Check out our boarding. Animals are much more than pets, they're family. Proudly providing services to our community for over 60 years. In 1956 Bay Animal Hospital was founded as a single doctor, mixed- farm and small animal practice. For over 60 years, Bay Animal Hospital has provided the Great Lakes Bay region with exceptional veterinary care. In the years of 2007 and 2008 the construction to our practice allowed us to expand and grow our hospital to become a multifaceted and dynamic medical practice. Bay Animal Hospital has grown to a 6 doctor practice with a staff of nearly 30 compassionate and highly talented team members. We provide comprehensive medical services for dogs, cats, ferrets, rabbits, and pocket pets. Over the last 6 decades much has changed in veterinary medicine, but our team’s commitment to providing compassionate, honest, and quality care has been our constant foundation. We are grateful for the deeply rooted relationships we have fostered for many generations and the new friendships we add daily to our Bay Animal family. At Bay Animal Hospital, where care and compassion come first, it is our mission to provide our patients with the very best care that modern veterinary medicine has to offer. We are dedicated to educating our staff and clients on a continual basis on how to provide the best possible care for all pets. The doctors and staff value every client and patient, as if they were part of our own family. 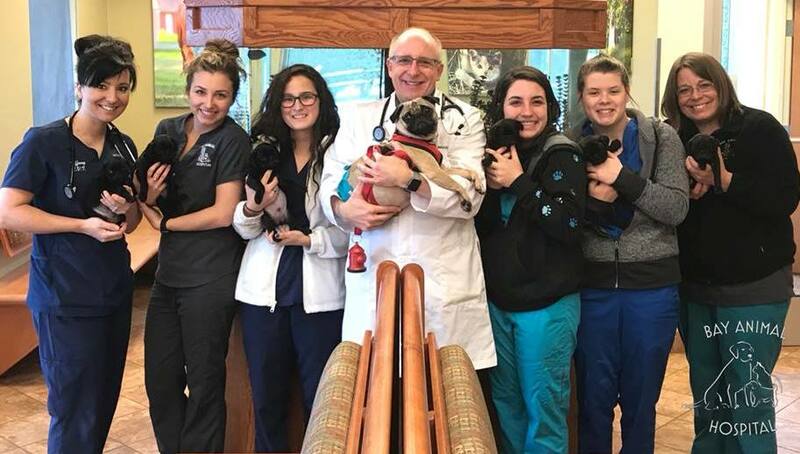 He enjoys all aspects of the canine and feline medicine with a particular interest in dermatology and internal medicine; including endocrine disorders and cancer medicine. His vision for Bay Animal Hospital is to provide our patients with access to state of the art medicine right here in our small town and treat our clients with compassion and honesty. He obtained a Bachelors in Science from Michigan State University. Also receiving his doctorate of veterinary medicine from MSU in 1995. He is a general practitioner with special interest in surgery, internal medicine and preventative care. He is a current member of the MVMA, AVMA, and SVVMA. After graduating she worked at a mixed animal practice near her hometown in Ohio for a few years before moving to Michigan with her family. Dr. Tomich has a special interest in preventative and shelter medicine, soft tissue surgery, and the human-animal bond. Dr. Hanna Vecsernyes is a Michigan native and a graduate of Michigan State University, College of Veterinary Medicine. Although first a loyal Spartan, she received her bachelor's degree from the University of Michigan-Flint, and also cheers for Maize and Blue. She was raised on a small farm in rural Michigan and is an avid outdoor enthusiast who enjoys hiking, canoeing and kayaking. She currently lives in Bay City with her rescue dog Nessa. After 11 years of practicing at M-20 Animal Hospital in Midland, Dr. Busch moved to Bay Animal Hospital full time in 2017 to provide care in the town she calls home. Her special interests include, but are not limited to, dermatology, internal medicine, surgery, preventative medicine for both dogs and cats. Her goal is to provide valuable communication so pet owners are better prepared to serve the needs of their pets. Dr. Wade is from South Carolina, but has lived in the Midwest for the past 6 years. She graduated from the University of Illinois, College of Veterinary Medicine in 2018 and is excited to become the newest member of the Bay team. She lives in Midland with her husband, 2 dogs, and 3 cats. When not working, she enjoys cheering for the South Carolina Gamecocks, hiking, running, and skiing. "They have always taken extremely good care of my animals. When one of our cats got extremely ill they were the only ones in town that had the capability to do what she needed to have done. They will always have my gratitude and my business for that reason." "Bay Animal Hospital has been so great with our little Luna girl. We just picked her up today from being spayed and the care that this hospital provided for our little girl was amazing. We are so lucky to have the doctors and staff at Bay Animal Hospital taking care of Luna! If you are looking for a vet for your four-legged family member, look no further!" "I can't say enough nice things about BAH. the ladies are so sweet and accommodating and they truly love your animal. and it shows. every time. thanks for taking such good care of Ollie this year."